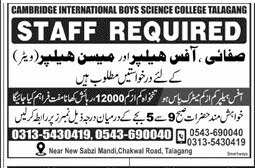 Below are the complete details of the Office Helper jobs in Cambridge International Boys Science College in Talagang . Skills Required for Job: Having Good Communication Skills. Good Team Working Skills.